We could talk for hours on the role of the web as a source of customers and information for them, but the broader question is, “where DO we get our customers in our industry?” Of course, they come from lots of different sources, from the traditional yellow pages, to repeat business, to word-of-mouth, and so forth. But here’s an advertising opportunity that I don’t think we are taking full advantage of. Where I live, the landscaping season is already here, and I don’t think a single one of those businesses doesn’t place a sign in the yard while doing the work. Beyond landscapers, every other home improvement specialists does it as well. What I don’t see, at least where I travel, are water systems contractors taking advantage of this. 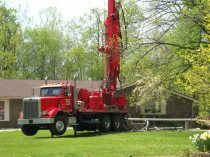 I travel in a lot of rural areas, and it’s not uncommon for me to see a rig set up either servicing a well or drilling a new one. Maybe it’s just me, but I hardly ever see a yard sign associated with the rig telling me who’s doing the work. I’m not sure why. They don’t cost much, and I think they’re probably pretty effective. If I’m in the market for a service, and I see a yard sign in my neighborhood for that service, I can’t help but to evaluate what kind of job they’re doing (the best I can) and make a mental note of who’s doing it. In a way, I’m thinking, if it’s good enough for my neighbor, maybe it’s good enough for me. It’s a more subtle form of word-of-mouth advertising. And, what we really have going for us in the industry is that if the rig is set up, one can’t drive by and not notice it. The next question, even if it’s fleeting, most poeple will have in their head is “I wonder what’s going on there?” If your sign is there, next to the road, they are going to make a connection between their water system and you. The above is just an observation, Maybe you’re already using yard signs, but if you’re not, think about it. They have a lot going for them. All of those other service providers can’t be wrong. I often posted a yard sign at the job site of any of my remodeling or home construction jobs. I had the value of yard signs explained to me by a new customer. During our conversation when he called I asked how he had gotten my name. He said, “I saw your sign in front of that big home on North Meridian and I figured if they had hired you to do work then you must be OK”. Over the next three years we remodeled three of his restaurants, rehabbed a rental home of his, and did over $70,000 of work at his residence. After his comment, without fail, a yard sign was posted in the front yard of the job site as I was leaving with a signed proposal. That one sign generated referrals that over the next few years totaled over $1K.